The donor is a 1981 R80rt, swapted by a r100rs engine. We acquired a stock BMW r80rt Monolever and decided to strip it back to its bare essentials and radical street racer. The large fairing was removed and the engine was removed from the frame, anything and everything that was surplus to requirement was removed before the rebuild process began. We have paid a lot of attention to weight, so the 230kg-or-so of the stock machine has been reduced to 180kg. 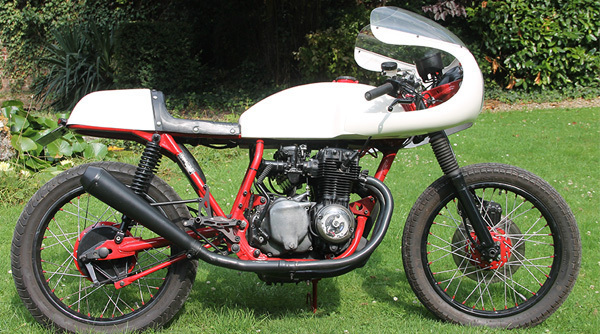 For some people, building a minimalist motorcycle simply means stripping off as much stuff as possible. And practicality be damned. But there’s a higher path: one that uses complex solutions to achieve maximum simplicity, without sacrificing functionality. That’s the philosophy behind this modified R100GS. The donor machine is a Yamaha TR1 from 1981. Build as a replica of the motorcycle presented by Doc Chop for Cafe Racer TV show, the aim was to replicate this amazing design, with some modification : we choose to made a mojav like full tank, bigger as the original one to fit perfectly with the scale of the bike. The engine internals have been left alone, but the stock Hitachi carbs have been removed, and replaced by one SU HIF, fitted with a tulip. Converted to a 2 into 1 intake manifold, 1.5" HIF SU Carb, dual harley muffler were addapted. The Honda CB is one of those motorcycles that seemed destined for cafe-racerization from the get go, it was lighter than its larger CB500 stablemate and when it comes to cafe racers, " Simplicate, then add lightness". There’s more radical frame (and swingarm) surgery further back, where the twin shocks of the stock XS850 have been ditched for a new monoshock setup. Exhaust and a reworked intake helped to give the engine its racer character. You must have, like us, some day, crossed the path of an ugly small custom and still reliable bike. The Honda CM 125, to us, belongs to this category. We made a classic scrambler, inspired by 90s martini bike for this project. Still small, still light and pleasant to drive, but different project. Goal here was to build a versatil scrambler, as for city cruising and off-road riding.